Guild gold: With so many awards shows, it's easy to forget which ones really matter. That's because they mostly all look the same. Many of them seem important because they're telecast on cable channels that are hungry for glittering live events. Even if they're not televised,they attract tons of media coverage, which means video footage turns up all over the Internet and on syndicated TV shows devoted to celebrities. Most of these shows featurethe same cast of red carpet celebs tackling the Big Question – "Who are you wearing tonight?" The nominees are pretty much the same no matter what show it is and so are most of the winners rushing to the stage to thank their laundry list of agents, managers, spouses and children. Only a handful of these awards ceremonies are actually meaningful in terms of their influence on the Oscars. Awards bestowed by critics groups, film festivals and other Hollywood enthusiasts don't significantly impact on the Oscars because their members aren't Academy members who can cast a vote. But awards by the Hollywood guilds are something else. These industry groups are, essentially, high class unions for those who toil in the movie making trenches directing, writing, acting, editing, filming, recording sound, creating costumes and makeup, etc. Since some but not all of their members are also members of the Academy's various branches, what these guilds honor at their own awards ceremonies strongly suggests how those of their members who also are Academy members may vote in the Oscar race. With that in mind, last weekend's awards by both the Producers Guild of America (PGA) and the Screen Actors Guild (SAG) are worth paying close attention to. Here's a look at the guild gold they handed out and what it may say about the Oscar race. The Producers Guild of America (PGA) announced its 26th annual movie and television producing awards Saturday night at the Hyatt Regency Century Plaza Hotel in Los Angeles. The Guild's nearly 6,800 members honor live action feature films with the Darryl F. Zanuck Award for Outstanding Producer.Over the past seven years, the PGA and the Academy, which has 6,100-plus members, have voted for the same live action best pictures -- although 2014's PGA vote was a tie between "12 Years a Slave" and "Gravity" while Academy members applauded "Slave." This year's 10 PGA best producing nominees, its equivalent of best picture,were: "American Sniper,""Birdman," "Boyhood," "Foxcatcher," "Gone Girl," "The Grand Budapest Hotel," "The Imitation Game," "Nightcrawler," "The Theory of Everything" and "Whiplash." With the exception of "Girl," "Foxcatcher" and "Nightcrawler," the PGA nominees also made it into Oscar's best picture race. The PGA award went to "Birdman," instantly making it the most likely best picture Oscar winner. With Oscar bloggers having been trumpeting "Boyhood" as the likely PGA victor and, therefore, the presumed Oscar choice, "Birdman's" triumph put a decidedly different face on the best picture race. Saturday's upset brings to mind the 2010 Oscar race when prior to the PGA awards "The Social Network"won the best picture-drama Golden Globe as well as Globes for directing, screenplay and score. "Social" was the odds-on Oscar front runner -- until the PGA unexpectedly crowned "The King's Speech." It was "Speech," of course, that went on to win the best picture Oscar. Since both the Academy and the PGA have been using the same complicated preferential voting system since 2009, the PGA results are widely regarded as a good indication of how the Oscar vote is likely to go. At this point, the safe bet seems "Birdman," although with the Academy,surprises are always possible. The PGA also presents an award for Outstanding Producer of Animated Theatrical Motion Pictures. This year's five nominees were: "Big Hero 6," "The Book of Life," "The Boxtrolls," "How to Train Your Dragon 2" and "The LEGO Movie." The award went to "LEGO," but there's no way it can win the best animated feature Oscar since Academy members didn't even nominate it. The Academy's five animated nominees included "Hero," "Boxtrolls" and "Dragon," but the Oscar crowd substituted "Song of the Sea" and "The Tale of Princess Kaguya." In 2014, the PGA's animated feature winner was "Frozen," which also won the best animated feature Oscar. The Screen Actors Guild (SAG)'s 21st annual awards were announced Sunday evening at L.A.'s Shrine Auditorium. SAG doesn't give a best picture award, but its best ensemble cast award is generally regarded as the equivalent. The SAG Awards are meaningful because actors make up the Academy's largest voting branch with nearly 1,180 out of 6,100-plus members. The performances SAG members honor also tend to get votes from those SAG members who also are Academy members. SAG's nominees this year were: "Birdman," "Boyhood," "Budapest," "Imitation" and "Everything," all five of which were among Oscar's eight best picture noms. SAG's award went to "Birdman." 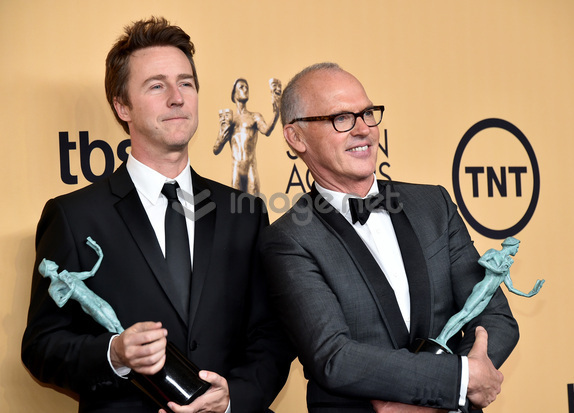 Coming on the heels of its PGA victory the previous night, "Birdman's" SAG success makes it the film to beat. SAG's ensemble cast award in 2014 went to "American Hustle"while Oscar's best picture was "12 Years a Slave." SAG also bestows four individual awards for acting in feature films. The Guild's best actor noms went to: Steve Carell ("Foxcatcher"), Benedict Cumberbatch ("Game"), Jake Gyllenhaal ("Nightcrawler"), Michael Keaton ("Birdman") and Eddie Redmayne ("Everything"). 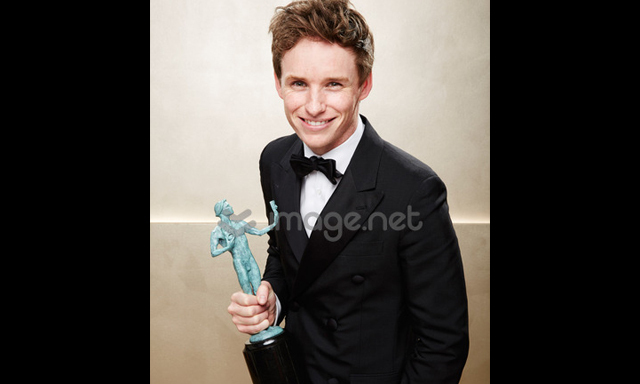 Redmayne's victory was the evening's only real surprise on the movie front. Insiders had been anticipating a Keaton win, particularly after "Birdman's" PGA triumph Saturday. Redmayne was seen as a possible spoiler, but the Oscar bloggers expected to hear Keaton's name. Going into the Oscar homestretch, Redmayne, who won the Globe for best actor-drama, and Keaton, who won the Globe for best actor-comedy or musical, will be neck and neck and every vote is bound to make a difference. Except for Gyllenhaal, all the SAG nominees are also Oscar nominated for lead actor. Academy members applauded Bradley Cooper for "Sniper" instead of Gyllenhaal. SAG's best lead male actor award in 2014 went to Matthew McConaughey for "Dallas Buyers Club," who also won the best actor Oscar. In the best actress race,SAG's nominees were: Jennifer Aniston ("Cake"), Felicity Jones ("Everything"), Julianne Moore ("Still Alice"), Rosamund Pike ("Gone Girl") and Reese Witherspoon ("Wild"). The award went to Moore as everyone handicapping the race had long anticipated. Moore previously won the Globe for actress-drama and also prevailed in votes by the Broadcast Film Critics and the National Board of Review. Oscar's best actress nominees are: Marion Cotillard ("Two Days, One Night"), Felicity Jones ("Everything"), Julianne Moore ("Still Alice"), Rosamund Pike ("Gone Girl") and Reese Witherspoon ("Wild"). In 2014 SAG's best lead female actor award went to Cate Blanchett for "Blue Jasmine." Blanchett also took home the best actress Oscar. SAG's supporting actor nominees were: "Robert Duvall ("The Judge"), Ethan Hawke ("Boyhood"), Edward Norton ("Birdman"), Mark Ruffalo ("Foxcatcher") and J.K. Simmons ("Whiplash"). Simmons won, as was widely expected following his victories with the Golden Globes, Broadcast Film Critics Association, New York Film Critics Circle, Los Angeles Film Critics Association and National Society of Film Critics. Simmons is now the strong front runner in Oscar's supporting actorrace, which includes the same five nominees. In 2014, SAG's supporting actor award went to Jared Leto for "Dallas Buyers Club." Leto also won the best supporting actor Oscar. SAG's supporting actress nominees were: Patricia Arquette ("Boyhood"), Keira Knightley ("Imitation"), Emma Stone ("Birdman"), Meryl Streep ("Into the Woods") and Naomi Watts ("St. Vincent"). The winner was Arquette, who was the strong favorite to win after taking home top honors from the Golden Globes, Broadcast Film Critics Association, Los Angeles Film Critics Association (which voted her best actress rather than supporting actress), New York Film Critics Circle and National Society of Film Critics. On the Oscar front, where Arquette is now the front runner, the supporting actress nominees are all of the above except Watts. Academy voters included Laura Dern ("Wild") instead. In 2014, SAG's supporting actress winner was Lupita Nyong'o for "Slave." She also took home the best supporting actress Oscar. Bottom line:Besides Guild gold, Hollywood also has an eye on box office gold. Last weekend saw Warner Bros. and Village Roadshow's "American Sniper"hold on to first place with $64.4 million. With its cume now at $200.1 million after only its second weekend in wide release, it's the only best picture Oscar nominee that's made the kind of boxoffice impact that could boost the telecast's ratings. Last weekend's overall ticket sales were up nearly 34 percent from last year. Although this Sunday's Super Bowl telecast won't be good news for Hollywood, there are high hopes that the year's strong momentum will continue in the coming weeks. "Almanac," fromfirst time feature director Dean Israelite, stars Amy Landecker, Sofia Black-D'Elia and Virginia Gardner. It's tracking best with men under 25.